Organized as a fundraiser by the Oregon Track Club — founded by Bowerman himself more than 50 years ago — the public is invited to meet the milers and hear their stories. The reunion, held at the John E. Jaqua Center for Student Athletes, will feature a social hour, panel discussion and question-and-answer session, and at the conclusion of the reunion attendees will head to Hayward Field for the 42nd running of the Prefontaine Classic. The sub-4 theme extends beyond the 10 honored guests, too. Tickets cost $25 for the public and $20 for OTC members, but if you’ve run a sub-4 mile it’s free. Hop Valley Brewing Company will debut a new beer, dubbed the Sub 4 Ale, at the event. Even the emcees, Andrew Wheating and Tom Farrell, are sub-4 milers. The Sub 4 Reunion gets underway at 5:30 p.m., and the panel discussion begins one hour later. “For years I’ve been thinking about how it would be really cool to have a reunion to get everybody who’s run a 4-minute-mile together in the same place at the same time, and so last summer I decided I was going to do it,” said the Oregon Track Club’s Todd Bosworth, the reunion organizer. The first sub-4-minute-mile was run in 1954, at the Iffley Road Track in Oxford, England. At the time, some thought the achievement was impossible. Run a mile in under four minutes? The human body simply wasn’t capable. But Roger Bannister, a medical student who would retire three months later to concentrate on his studies, broke the tape in 3:59.4, cementing his name in the history books. The achievement made him a worldwide celebrity — he was named Sports Illustrated’s first-ever Sportsman of the Year, and on the 50th anniversary of his feat a stopwatch and a rendering of his legs was added to Britain’s 50-pence coin. While Bannister was running, 5,000 miles away in Eugene, Oregon, decorated war veteran and former UO football player Bill Bowerman was in his sixth season as head coach of the University of Oregon track and field team. At the time the Ducks were 20 years removed from their last conference title, and 18 years removed from their last Olympic medalist, but they were on the cusp of a run that would leave the world in its wake. In 1956, two years after Bannister’s race, the 4-minute-mile barrier was broken on American soil for the first time. Forty thousand fans packed the Los Angeles Coliseum to see world-record holder John Landy run the distance as part of a specially organized meet; the rabbit was Jim Bailey, the reigning NCAA mile champion and a 26-year-old UO sophomore. Only, Bailey turned the race on its head and beat Landy to the finish line, crossing in 3:58.6. 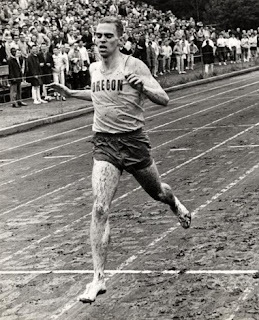 The first Duck to run a sub-4-minute mile soon had plenty of company, as Jim Grelle (who earned the distinction after graduating), Dyrol Byrleson, Keith Forman, Archie San Romani, Wade Bell, Dave Wilborn, Arne Kvalheim, Roscoe Divine, Steve Prefontaine and Steve Savage all also recorded sub-4 times over the next 14 years. 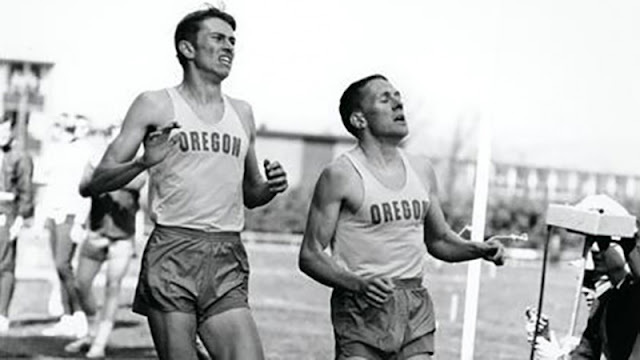 Between Bailey running 3:58.6 in 1956 and Savage running 3:59.2 in 1970, the Ducks represented one tenth of the world’s sub-4 milers, and accounted for one third of all sub-4miles run. The UO won four of Bowerman’s five NCAA titles during that time, and established the university as a national track and field powerhouse. Money raised from the event will help the Oregon Track Club fund local grassroots running programs.